Of all the ingredients I use in my recipes, the one I’m asked about the most is nutritional yeast. I’ve been cooking with it for so long that I forget how strange it must sound to people who are new to vegan cooking. Neither the word “nutritional” nor the word “yeast” conjures up mouthwatering images, but the truth is, it’s one of the few “health food store” ingredients that I wouldn’t want to have to do without, not because of its nutritional value, but because of its flavor. So what is it, why should you use it, and where can you find it? Nutritional yeast has such an unappealing name that somebody started calling it “nooch” and the name caught on in some corners of the internet. The brand that most vegans use is Red Star Vegetarian Support Formula because it is a good source of vitamin B12 and contains no whey, an animal product that is used in some other brands. In the U.K., nutritional yeast is sold under the Engevita brand and in Australia as savory yeast flakes. You probably won’t be able to find nutritional yeast in a typical grocery store. I buy it from the bulk bins at the local natural food store, where it is labeled “Vegetarian Support Formula.” Larger grocery stores might have Bob’s Red Mill or Braggs brand in the natural food section. If you can’t find it locally, Amazon has several brands, including Foods Alive and Sari, which aren’t fortified (more on that later.) Some brands of nutritional yeast taste better than others, so if you can, buy a little and taste it first; if you don’t like it, try another brand. I use the flaked version of nutritional yeast, but it’s also available in a powder. If you’re using the powder, you will need only about half as much as the flakes. As you can guess from its name, nutritional yeast is packed with nutrition, particularly B-vitamins, folic acid, selenium, zinc, and protein. It’s low in fat, is gluten-free (check specific brands for certification), and contains no added sugars or preservatives. Because vitamin B12 is absent from plant foods unless it’s added as a supplement, nutritional yeast that contains B12, such as Red Star Vegetarian Support Formula, is often added to the vegan diet just to get that one nutrient (though I strongly recommend taking a supplement as the only way to be sure you’re getting enough). Not all nooch has B12, so check the label carefully before buying, and be aware that concerns have been raised over Folic acid, which is often added along with B12. The vitamins and minerals are all well and good, but truthfully, most people use nutritional yeast for its flavor. Nutritional yeast has a flavor that has been described as cheesy, nutty, savory, and “umami.” Just a tablespoon or two can add richness to soups, gravies, and other dishes, and larger amounts can make “cheese” sauces and eggless scrambles taste cheesy and eggy. Adding a small amount of nutritional yeast to a dish enhances the flavors present and helps form a rich flavor base. If for some reason you can’t find nutritional yeast or can’t use it, you can safely leave it out of recipes where it’s used in small amounts as only a flavor enhancer; in some cases, miso or soy sauce can be used in a 1:3 ratio (1/3 of the amount of nooch called for), though both add sodium, so you may need to reduce the salt. 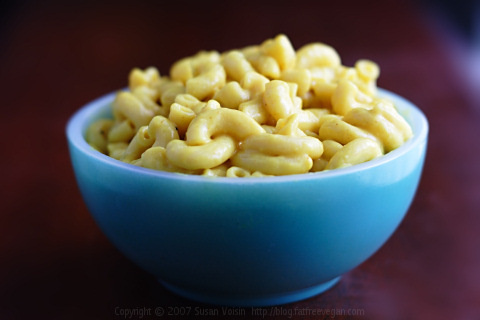 In recipes where nutritional yeast provides the bulk of the flavor, such as vegan cheese sauces, it’s best not to attempt to substitute it. No. The savory, umami taste of nutritional yeast comes from glutamaic acid, an amino acid that is formed during the drying process. Glutamic acid is a naturally occurring amino acid found in many fruits and vegetables and is not the same as the commercial additive monosodium glutamate. Add a little to the cooking water for “cheesy grits” or polenta. Sprinkle on any pasta dish. These recipes use small amounts of nutritional yeast to form a flavor base and are good for beginning users. In many of these recipes, nutritional yeast is a central ingredient adding much of the flavor. Leaving it out isn’t advised. 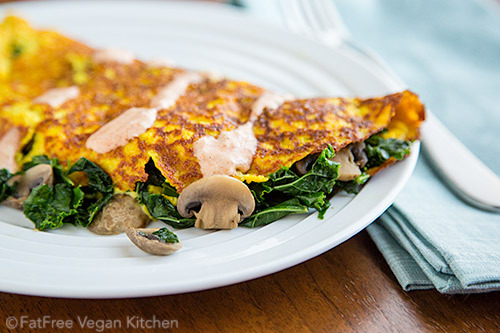 Nutritional yeast contributes a lot of flavor to these tofu-based “egg” dishes. Update 11/2014: There have been studies (such as this one and this one) that raise the concern that high amounts of synthetic folic acid may increase the risk of breast cancer. Most brands of nutritional yeast do contain added folic acid in varying amounts. If you are concerned about this, read labels carefully and choose brands that contain as little as possible. I know of three brands of nutritional yeast that don’t contain synthetic folic acid: Sari Foods, KAL Unfortified Yeast Flakes, and Foods Alive Non-synthetic Nutritional Yeast, which is what I use in all my cooking (Sari is expensive and I’m not a fan of KAL’s flavor.) If you know of other brands, please leave details in the comments. Update 3/2017: Recently, a vegan magazine claimed on its blog that nutritional yeast is under attack by the EPA. The article got a lot of vegans worked up with insinuations that veganism is being targeted. It was all based on a misreading (or not reading at all) of proposed amendments to the EPA rules on the manufacture of both baker’s and nutritional yeast. The rules are not new and were put in place to protect workers and the environment from carcinogens formed when large factories make these types of yeast (Saccharomyces cerevisiae). 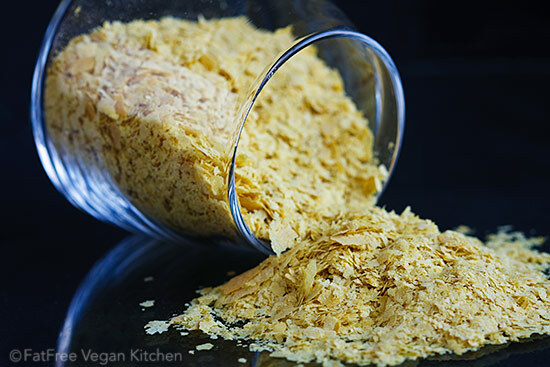 Please, if you see the article being posted, know that nutritional yeast is not under threat, the price will not be rising (unless people start hoarding it), and it is not going off the market. Don’t buy into the hysteria. Here is a link to the EPA page with all the necessary documents, so you can read it for yourself: https://www.epa.gov/stationary-sources-air-pollution/manufacturing-nutritional-yeast-national-emission-standards. 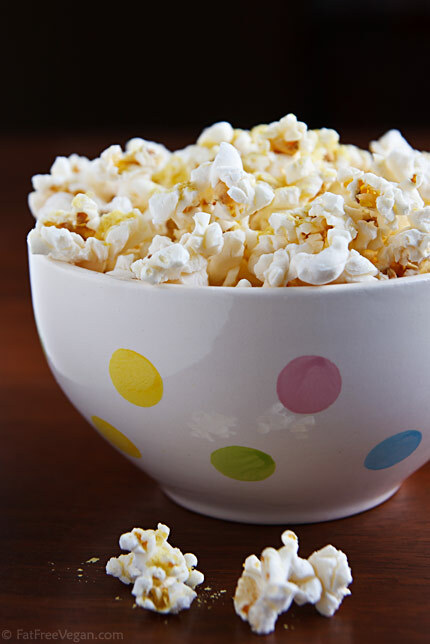 Please share your favorite ways to use nutritional yeast in the comments below. This post contains affiliate links to Amazon. When you buy something through them, I receive a few pennies that help keep this site alive and kicking. Thank you! Is nutritional yeast lectin free or autoimmune diet safe? The latest reports say that cobalt – based B 12 is carcinogenic. Are any of the yeasts that you report on here free from cobalt – based B 12? Great article, and thank you for the 2017 update. I love the name “nooch” too! Great information on Nutritional yeast. Only big question I’ve not been able to find answers to is about the molasses used to grow the yeast on. There are two kinds of molasses, one made from sugar cane, and one made from sugar beet. The sugar beet one is at a very high risk of being made from 100% genetically engineered sugar beets. 95% of sugar beets in North America are genetically engineered. I personally would not want to eat nutritional yeast that is grown on sugar beet molasses. Yet no brand tells anything about the type of molasses used or if it’s genetically engineered? I also would love to find a nutritional yeast that is grown on organic sugarcane molasses. Surely there is risk of pesticide residues in the substrate affecting the nutritional yeast. Can you help shed some light on this? 1. does nutritional yeast contribute to yeast infections? 2. vitamin suppliments (b12 too), upset my stomach–i have this hypersalivation thing called salaria when i take vitamins–odd, but true. you said to add suppliments in case? any othersuggestions? You were doing so well and then you went off into « making up the chemistry as I go » territory. Seriously, glutamate is the predominant counter ion in all living cells, so you bet yeast and all cells are loaded with it. Glutamic acid is merely the acidic form, and at physiological pH will be ionized…ie in the glutamate form. No it isn’t added extra, but naturally occuring doesn’t mean it isnt there. Thank you so much. I’ve been looking for something to substitute cheese, as my son is allergic to casein. This information is going to change a lot of things for my son, especially variety in food. Nutritional yeast lists it has folic acid in it. For people like me who have a gene mutation called MTHFR we can’t have FOLIC ACID. We can have folate or folinic acid, but not FOLIC ACID. We can’t assimilate it and it builds up and becomes toxic in our bodies causing a lot of health problems. Tell me, in Nutritional yeast is it indeed FOLIC ACID, or is it FOLATE or FOLINIC ACID? I love the taste of the stuff, but am afraid to eat it because of the consequences. If it is one of the other two, I could have it. The reason I asked is because another wonderful product which listed Folic Acid, when questioned they said, sorry it is Folate – so I could use it. 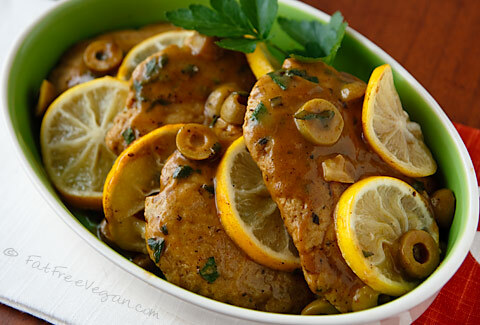 Food yeast is more than 50% protein, so they can be used as a substitute for meat and fish. The characteristic “cheese” taste allows you to add them to pizza, casseroles, sauces, omelettes, pasta and other dishes. They also reduce cholesterol, normalize the pressure and intestinal motility, while improving its microflora, and also act as a prevention of pancreatic cancer. Dry yeast struggles with anemia, strengthens immunity and eliminates dysbacteriosis. But the most interesting are beer yeast, the benefits and positive properties of which are very diverse. Please, if you truly want a more vegan world, help by sharing the info. I add nutritional yeast flakes to my gravy & a lot of sauces. I have a Dijon/nutritional yeast scalloped potato recipe that is as good as any dairy cheese dish. I add nutritional yeast flakes to my biscuits. They are a lovely golden color & taste fantastic. My cat loves the inside of these biscuits & always comes around when she smells them baking. I mix nutritional yeast flakes with herbs & add to my miso drink, which is really good on an upset stomach or on a cold morning. It’s a flavor that has really grown on me over the years. I bought some portobello mushrooms the other day (I have been a vegetarian for 40 years ) and whilst I crack an egg into them and cook it in an air fryer for breakfast, as at somewhat of a loss with what to do with them other than that. Then I saw some of your recipes contain Nutritional Yeast, which I had never heard of. So I read your page “What the heck is Nutritional Yeast “, and recalled that I have been found to be Vit B deficient in the past. I do take supplements now. So that was yesterday, today I went to Tesco (a large chain supermarket) and whilst looking for vegetable bouillon powder came across a tub of nutritional yeast flakes just lying on the shelf, obviously discarded by a customer. So I bought and look forward to trying out your recipes which call for it. REALLY GREAT INFORMATION! AS WELL AS THE WONDERFUL ROUND UP OF RECIPES!, THANKS. 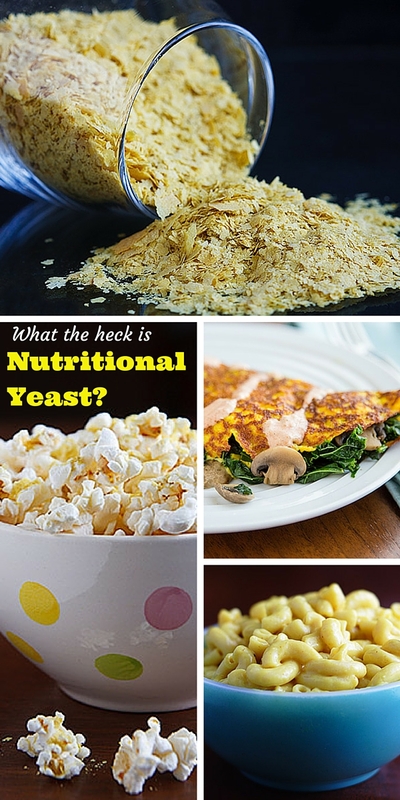 I read through all these comments and found some great ideas for nutritional yeast. I did see a few people who said they didn’t like it. I was the same way until someone hipped me to non-fortified nutritional yeast! I buy Sari Foods Non-fortified nutritional yeast and it’s not bitter at all. I keep it in the fridge and use it mostly to make punk rock chickpea gravy. Yum!